Cedefop Acting Director Mara Brugia opened the event, telling participants that the agency’s three-year study on VET’s changing nature and role, which finishes at the end of the year, aims to explore with stakeholders potential risks and opportunities VET may face in the coming decade and inform EU-level reflection and country-context action. Taking a look at the past, she said that VET has gone in and out of fashion over time, but the shock of the economic downturn has lifted it up on the EU policy agenda and has led to a renaissance in apprenticeships. Some VET systems may be more future-proof than others, she concluded. Christian Dorninger, from the Austrian Ministry of Education, Science and Research, in his address on behalf of the Austrian EU Presidency, praised the decision to organise the European vocational skills week 2018 in Vienna. Cedefop expert Jens Bjornavold, the project coordinator, and researcher Jörg Markowitsch presented the study findings. Cedefop has been supported by a big research consortium and experts from all 30 countries covered by the study. Mr Bjornavold stressed the positive narrative that VET is expanding, diversifying and its higher education element is increasing. Overall figures show that VET has been declining since 2005, but if we look at individual countries, there are positive developments in many of them. Mr Markowitsch noted that there are different visions and scenarios in the minds of people for VET in 2035. UNESCO/UNEVOC Director Shyamal Majumdar gave a global perspective of VET trends. Technical VET and skills are centre stage in the world now; you don't need a researcher to tell you that, he said, adding that Europe and the rest of the world face similar challenges. Participants then went deeper into the themes in Cedefop's study at the six workshops. The second day started with Mr Bjornavold presenting the workshop findings and Cedefop Head of Department for VET Systems and Institutions Loukas Zahilas outlining three scenarios for VET to 2035 based on the agency's study. Each of three experts then made the case for each of them: the pluralistic, the distinctive and the special purpose vocational education and training. The pluralistic scenario was presented by the UK’s Andrew McCoshan. The scenario foresees a VET distinguished by its close education system links rather than as a sector; organised around qualifications with diverse target groups; numerous VET pathways operate side by side, strongly individualised; and there is a widening variety of providers. BIBB’s Philippe Grollmann presented the distinctive VET model, which includes: VET being a clearly defined sub-sector of the education and training system; organised around occupations/professions; apprenticeships are the ‘gold standard' offered up to level 8; and provision is employer-led. Cedefop expert Anastasia Pouliou presented the ‘difficult’ scenario of marginalised or special purpose VET. Its key components are: skills training for labour market inclusion; VET is mainly for adults in need of reskilling or upskilling or at risk of social exclusion and unemployment; no pathway in particular but emphasis on labour market (re)entry; type of provision will be short training courses with some on-the-job training. Participants provided lively feedback on the scenarios, with some interesting ideas up for discussion. A panel discussion followed. ‘We all agree that vocational education and training is the way forward but there are challenges, most importantly labour market conditions,’ said the European Apprentices Network’s Frederic Piccavet. The European Trade Union Confederation’s Agnes Roman pointed to the quality framework for apprenticeships decided by the European Council this year to help ensure training is of high quality. Representing the employers, BusinessEurope’s Robert Plummer said companies have a positive outlook on VET, but need to be more incentivised. 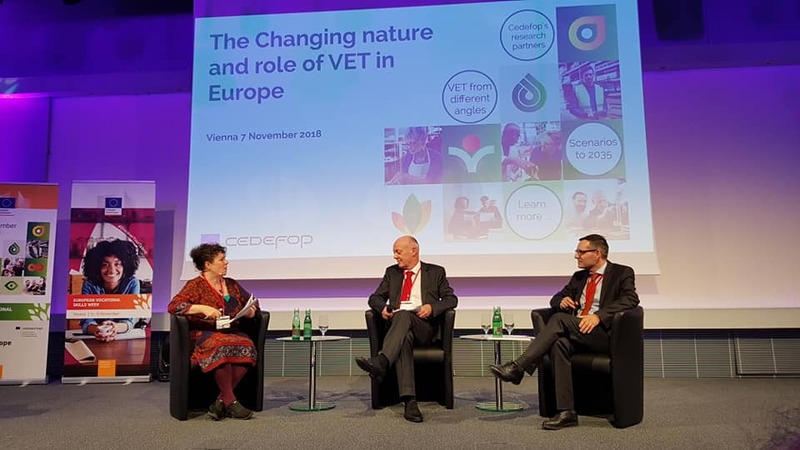 Mr Onestini thanked Cedefop for setting up the discussion and argued that the scenarios show end possibilities but the starting points of VET systems are different. In her closing remarks, DG Employment Director Manuela Geleng noted that Cedefop's flagship project ‘comes at the right time when we start to think about post-2020’ and thanked the agency for providing 'such good material to have a very successful event'. Cedefop will take into account the conference discussions to finalise the study scenarios by the end of 2018.